The Legendary Toyota Supra - Why Is it So Popular? Came a cross a good deal on a modified MkIV Supra from 1993 and decided to pick it up. I have always been a huge fan of the 2JZ-GTE twin turbo motor and have been around them for a while. Arguably the best motor ever assembled from a reliability standpoint and does it love power. This the top driver car available, at least in my opinion. Toyota to some time and patience in every detail developing this car, the dashboard with its instrument cluster directed to the driver is a work of art. This thing is a monster! Going to the drag strip and watching Supras demolish full on drag cars with ease. So much support for parts, large cult like following, great styling, and awesome functionality, Only increasing in value. 2002 Toyota Supra - My baby. I liked everything about this car, from its design to its color. This car is perfect for me. Used it to enter a sports car club and I also use it with children and my wife. Everything from its design to its color. This car has no negatives. This car is perfect. I liked the comfort and power that this vehicle had. What I do not like is that it uses a lot of gas and is expensive to refill the tank. I drove the car through the beautiful streets of New York. I tried the car at full speed, and I loved that satisfaction of that strength that Toyota brings. You use a lot of gas. After two decades off the market in the U.S., the Toyota Supra has been in the headlines more and more over the past few years. And for good reason; not only are collectors starting to push the prices higher on clean examples from the 1990s but Toyota has spent that past five years stoking enthusiasts' passion for its upcoming fifth-generation model, set to be released at the 2019 Detroit Auto Show and due on sale in 2019. Once viewed as little more than a ramped-up version of the Celica coupe, the Supra has found a place in the spotlight lately, and not in a subtle way. In particular, Toyota's fourth-generation A80 Supra produced from 1993 to 1998 has captured the hearts of Generation Xers and millennials, as well as old-school fans who grew up worshiping the car. Here's a look at what the resilient Supra is up to now, as well as a look at its past. A stock, factory-condition manual twin-turbo 1994 Toyota Supra recently sold at an auction for a staggering $121,000. 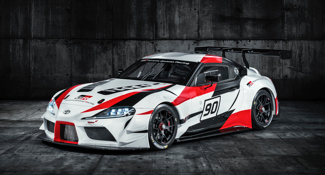 While that cost is unlikely to be the new norm, it does officially solidify the Supra as a six-figure vehicle. So, why was did this particular Supra fetch such a high price? For one, it's a collectible from the past that still has all of its original components intact. From the iconic rear spoiler to its original aluminum alloy wheels and Bridgestone Potenza tires to the mint tan leather seats, this Supra has all the stock goods, right down to the cassette tape/CD player. It also has just 7,000 miles on it, which is naturally a rarity when it comes to vehicles this old. The fact that the car was also unmodified increases its scarcity, as Supras from this generation were often modified and customized, making the unaltered examples a rarity. Beyond its nostalgia-inducing aesthetics, this Supra also has the highly desirable drivetrain configuration: the 3.0-liter, twin-turbocharged inline-six engine with 320 horsepower and 315 pound-feet of torque, paired with a six-speed manual transmission. 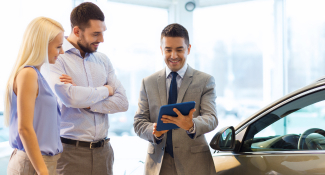 Most of this generation's models were offered with a lesser base inline six-cylinder engine and either a five-speed manual or four-speed automatic. Finally, the high price tag is due to simple supply and demand. While $121,000 seems like a lot for this car, there’s a long runway of growth potential for a rare model like this. Collectors who appreciate these models are relatively young; with time their budgets for the perfect car they coveted as a kid will increase, while Supras as clean as this one will only become harder to find. 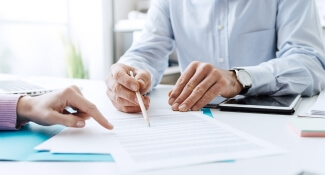 More demand and less supply means prices have plenty of room to grow. The Supra made its comeback for the first time since the final Toyota Supra was sold in the U.S. in 1998. 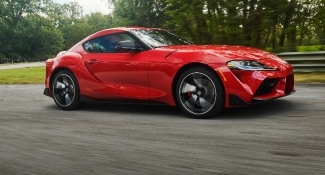 A fifth-generation Supra, the A90, -- largely developed by BMW and using a BMW powertrain and many other components from the new Z4 -- was unveiled at the 2019 North American International Auto Show (NAIAS) that happened in Detroit from January 14 - 27. It's the first time a new Supra will be offered in over two decades, so naturally excitement is high. It has a 335 horsepower inline six-cyclinder turbochared engine that's paired with an eight-speed automatic transmission and rear-wheel drive. Featuring a low center of gravity and a 50-50 weight balance, it also optimizes aerodynamic balance. The 2020 Supra goes on sale in the summer of 2019 and will come in two grades, 3.0 and 3.0 Premium, in addition to a "Launch Edition." Colors will include Renaissance Red 2.0, Nitro Yellow, and Downshift Blue. While $121K may seem like a lot to ask for a Supra (and it is), surprisingly, one other Supra has sold for more. An orange 1993 Supra was driven by the late Paul Walker in the original 'Fast and Furious' movie, sparking a younger generations' love for the vehicle. 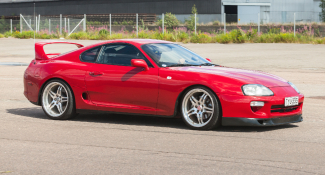 Unlike the recent auction of the all-original Supra, this film car was highly modified, including a full roll cage, fuel cell (race-ready gas tank), a nitrous-oxide system, body modifications and a massive rear spoiler. The 'Fast and Furious' vehicle sold for $185,000 at a 2015 Mecum auction, a pretty penny to pay for movie memorabilia. Now that you're caught up to speed let's take a stroll down memory lane. Once you see how the Supra evolved over four generations, you should better understand why that final fourth generation has become so popular since the 1998 Toyota Supra marked the (temporary) end of the line. While the original Supra was produced in Japan in 1978, it first became available in the U.S. in 1979. The first two Supra generations were called the Celica Supra because the vehicle was essentially a Celica that had its wheelbase stretched by 5.1 inches to accommodate the larger engine. The first generation was powered by a 110-horsepower, 2.6-liter inline-six. 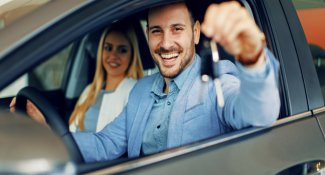 It came standard with a five-speed manual transmission, but buyers could opt for a four-speed automatic. In 1981, Toyota redesigned the Celica Supra and released the new iteration for the 1982 model year. The major change was swapping the first-generation's live rear axle for independent semi-trailing arms. This change helped the car earn a fourth place as the best-handling imported car in a 'Car and Driver' comparison test, beating two Porsches as well as a Lotus and a Ferrari. The engine was a new twin-cam 2.8-liter inline-six that produced 145 horsepower -- 29 horsepower more than the first generation. The third generation marks when the Celica Supra would lose the Celica name. 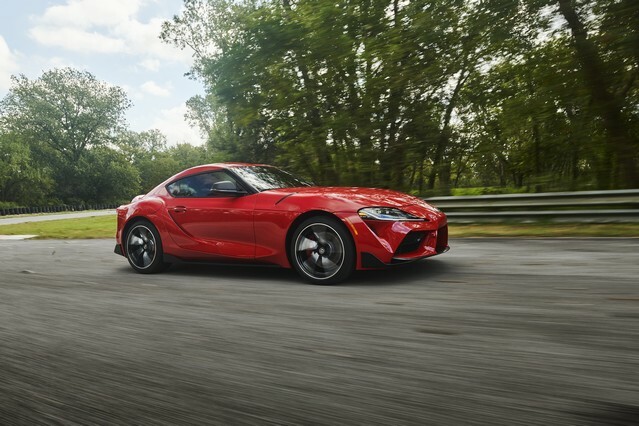 The new Supra further upgraded the power too, using a 3.0-liter inline-six engine to make 200 horsepower -- 55 horsepower more than the second generation. In 1987, Toyota released a Supra Turbo model that boasted a straight-six engine that produced 230 horsepower. The fourth generation marked the most drastic changes, including a complete body redesign that boasted the modern, swoopy styling that fans fell in love with. A signature interior dash layout that is still marveled by many automotive enthusiasts today. This generation shared its platform with the Lexus SC coupe, though it measured more than a foot shorter. A standard Supra came with a 3.0-liter inline-six engine that produced 220 horsepower -- 10 horsepower less than the third generation’s turbo model. However, the fourth generation Supra Turbo made 320 horsepower -- a 100 horsepower upgrade, with minor performance upgrades the supra can reach exotic car performance for the fraction of an exotic car price. While the vehicle was available until 2002 in Japan, U.S. emissions standards halted production in 1998. The 1998 toyota supra configurations have become some of the most popular and had minor updates from the 1996 variant, including both automatic and manual transmissions plus a three-spoke steering wheel. While the Supra's recent surge in popularity is due to Toyota's years of teasing the new fifth-generation A90 model, the nameplate also benefits from plenty of residual love from car fans. The fourth generation's curvaceous, seductive design and performance specs (for its era) holds a special place in the hearts of sports car enthusiasts and collectors. For many, the Supra was an introduction to the world of sports cars, and unlike the more unattainable exotic supercars of its era, this one seemed more in reach. The 'Fast and Furious' connection also helped to indoctrinate a new generation of Supra fans who loved the vehicle's looks and performance plus its potential for modification. The unveiling of the 2020 Supra was a thrilling moment for anyone who appreciates sports cars. Oh, and if you happen to run into a stock fourth-gen Toyota Supra in great condition, do yourself a favor and pick it up. Even 20 years later, it's clear that this unstoppable sports car has plenty of life left in it.